If you are a fan of a great cherry limeade, then I probably don't have to talk you into giving this yummy cheesecake recipe from Gimme Some Oven a try. Doesn't it just sound like a perfect summer picnic treat. Maybe baked in a jar so you can take it with you! And while you are waiting for the perfect opportunity to give this cheesecake a try, head to Taco Bell and try their new cherry limeade. I am serious. Beats Sonic hands down. Of course, their ice isn't as great. So maybe swing by Sonic to get a glass of ice and then hit the Taco Bell drive through. 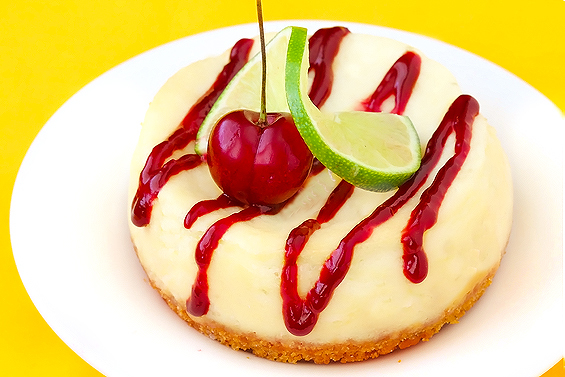 And then hit the grocery store to get the ingredients to make this delicious cherry limeade cheesecake. We love love cheesecake and we will be making this delicious recipe! Thanks for sharing, always up for a new recipe and a fantastic way to present it such as you have done here! Beautiful and delicious, can't get any better than that!